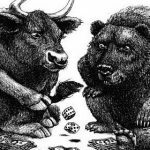 Is Darwinex Broker social trading feature useful? Find out in this review! The Darwinex forex broker is unique because it allows you to not only trade but prove your skills and have investors back you as well. 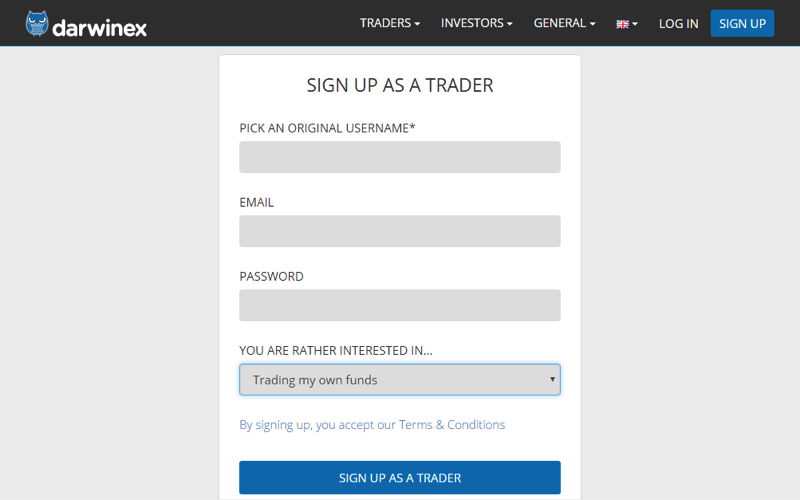 You can open a demo account by registering as an investor or a trader. It is a fairly simple process where you pick a username, give your email and a password and you are ready to go. The demo account is a great way to practice your trading skills before you are ready to put actual money on the line. Once you have registered and decided you want to switch from demo to a live account, you deposit your funds with the minimum for an individual account being €/$/£500 and €/$/£100 for a corporate account. You can deposit funds via Skrill, Visa, Neteller, bank transfer and Union Pay. An interesting thing that the Darwinex broker has done is they have allowed you to link your MT4 accounts from other brokers to Darwinex. This allows you to use your previous track record for analytical purposes. However, they only put Darwin accounts on their lists to ensure that both you and their investors get the best service possible. The Darwinex forex broker currently uses the MT4 platform for desktop, iOS and Android. The MT4 platform is known throughout the financial world for its comprehensive set of tools that provide in depth analysis which is extremely valuable to traders. 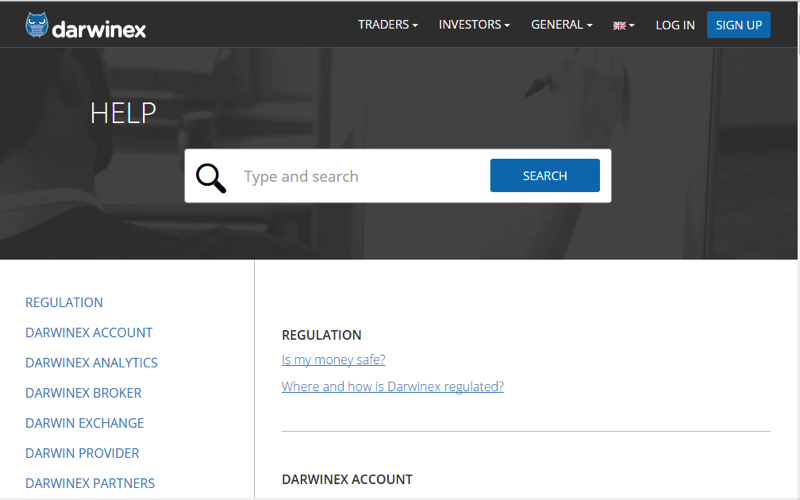 Another benefit of Darwinex using the MT4 platform is as mentioned before; allowing users to migrate their accounts from other brokers which aids in your progress on their site. While the desktop platform needs to be downloaded, it is well worth the download as it provides you with just what you need to not only earn but also showcase your skills. The Darwinex forex broker provides customer support through email and telephone, however these methods are not often needed as their FAQ section, provides you with a detailed list of answers to any possible questions you may have. To make it even better you do not have to manually search through the list yourself but simply use the search bar at the top of the page to find what you are looking for with ease. The Darwinex broker does not charge withdrawal fees, however, there other costs, namely bank fees, which you can incur when withdrawing your funds. 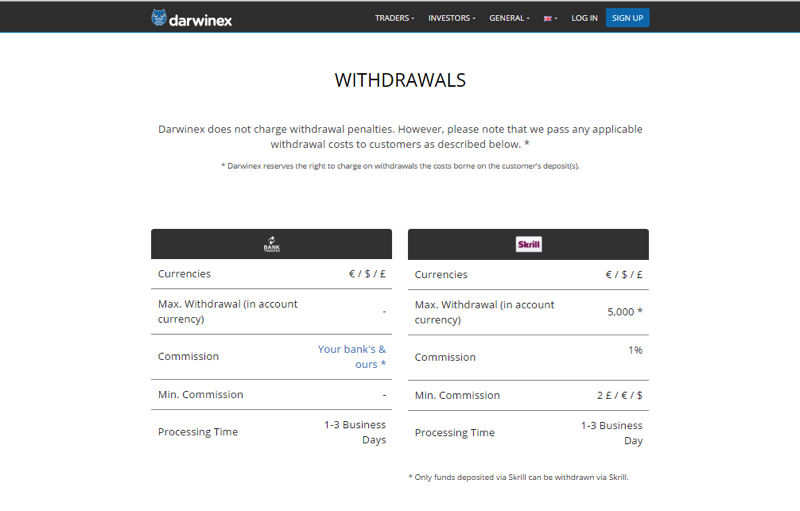 It seems Darwinex’s opinion is that it is best to be transparent and straightforward because on their website they clearly display how much you could possibly have to pay your bank or other financial institutions if you are to withdraw your funds using that method. 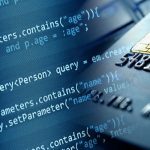 You can withdraw your funds via bank transfer, Neteller, Skrill and Union Pay, however, it should be noted that you can only withdraw funds via Neteller, Skrill and Union Pay if you deposited your funds using those methods. The processing time for each method is the same, 1-3 business days. However .it should be noted that the currency available for each method is different. 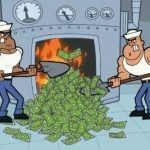 Bank transfers, Neteller and Skrill are available in Pound, Euro, and the Dollar while Union Pay is only available in the Dollar.